Lucky us. Each of our six towns has its own library. And these aren’t your everyday, run-of-the-mill libraries. They have more cool stuff to check out than you’d ever imagine—tools, musical instruments, cooking equipment, metal detectors, laptops, board games, craft kits. They have so many thoughtful programs—from concerts and live animal storytimes to mini-golf, writing workshops and glow yoga—that they function as defacto community centers. All that and thousands of books, too. Literally thousands. By our count, the six libraries have a total of more than 180,000 books between them. This being winter, we’re particularly grateful to our libraries for keeping the lights on, welcoming us with comfortable chairs and sometimes even a hot lunch. Whether you’re seven years old or 70, if you’re spending winter on the Vineyard, you owe it to yourself to check out our Island libraries. Start by taking a look at our library primer. Hours: Tues., Thurs. 2 p.m. to 7 p.m.
"During the off-season, the library winds up being a place that kids and families can come and learn something from each other or just see neighbors and friendly faces." Hours: Tues., Thurs., Sat. 10:30 a.m. to 5 p.m.
"Our mission is to make this a place where everyone who walks through the door thinks that there's something for them here." Hours: Mon., Thurs.-Sat. 10 a.m. to 5 p.m.
Tues., Wed. 10 a.m. to 8 p.m. Guitar workshops, slow cooking class, winter film series "Into the Heart of Art"
"We’re not school, we’re not home, we’re this fun in-between world where kids can explore who they are and explore their literary and artistic endeavors." Hours:Tues.,Thurs. 10 a.m. to 8 p.m.
Wed., Fri. 10 a.m. to 5 p.m.
"This library feels like it could be your own home. We try to maintain that living room." Hours: Mon., Weds., Sat. 10 a.m. to 5:30 p.m.
Tues., Thurs. 10 a.m. to 8 p.m.
Fri. 1 p.m. to 5:30 p.m.
"We have a real commitment to adult programming. We really focus on having a good core collection of the classics and more contemporary classics." Hours: Mon. 10 a.m. to 9 p.m.
Tues. - Thurs. 10 a.m. to 6 p.m.
Fri.- Sat. 10 a.m. to 5 p.m.
Sun. 1 p.m. to 5 p.m.
"We're a library that's very interested in ex- ploring the outdoors to see what nature is all about; we're interested in what's outside as well as what's inside." This is a wonderful profile on our Vineyard libraries. 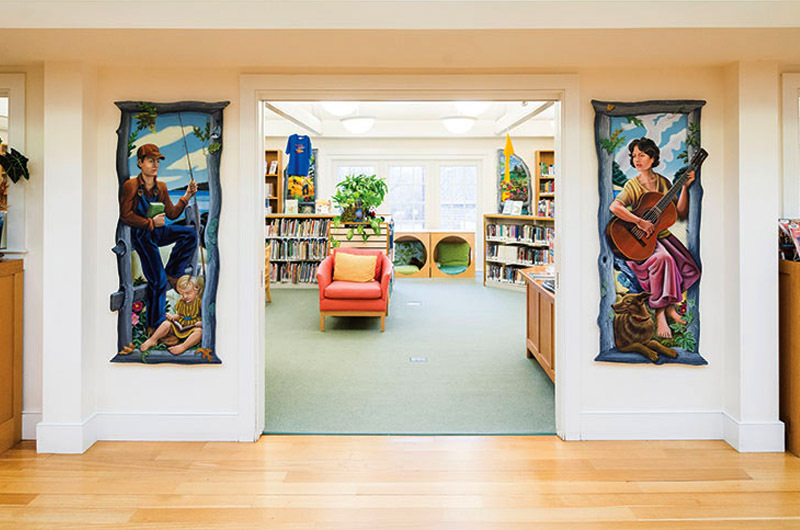 Of note, but not recognized in the article, are the magical paintings done by our talented islander, Margot Datz, as is shown in the murals in the photo at the entrance of the Chilmark Library and some of the other photos. I cannot speak for the other libraries, but in West Tisbury our library director, Beth Kramer, has created not just a well-functioning library, but a true community center.